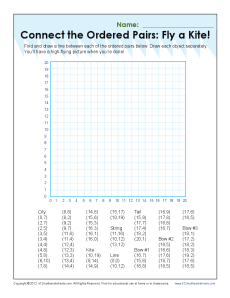 Connect the Ordered Pairs: Fly a Kite! Your student will be in the clouds when she finishes this worksheet! She'll draw and connect a series of ordered pairs, and when she's done, she'll have a picture of a kite flying above a city. You'll find it helpful with 5th grade Common Core Standards for Geometry. Other students may also use it as appropriate.